In public speaking, presenters are encouraged to picture their venues, audience and themselves delivering their message. In addition to imagining these things, I also picture my accessories, shoes and what I’ll be wearing when I deliver a message. Actually, it’s the first thing I imagine when I’ve accepted a speaking invitation. Call me shallow, but knowing what to wear as a preacher who is also a woman can be tricky and fraught with criticism. 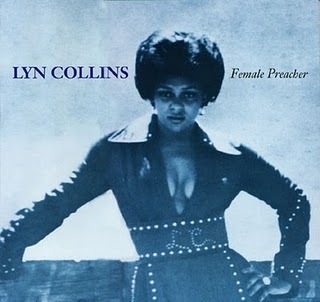 googling 'female preacher' yielded this image of Lyn Collins- contemporary of Bootsy collins in the 1970's funk scene. I neither condone nor endorse studded leather bodysuits or cleavage while preaching. In two weeks I’ll be making the annual pilgrimage to Cedar Campus, InterVarsity’s training center in Michigan’s Upper Peninsula. Along the gorgeous shores of Lake Huron hundreds of students across the midwest come each Spring to meet with God at the end of their semester, receive training on how to lead Bible studies, share their faith, and make plans of how to engage the campus with the person of Jesus. In two weeks I’ll get to preach to about 300 of these students on ‘multi-ethnic witnessing communities’ out of Acts chapters 6-10. I’m looking forward to what God will do in and through me during these weeks; for me personally and the students I’ve worked with over the past 10 years God often works in amazingly transformative ways at Cedar. In many ways I consider myself fortunate to work for an interdenominational student ministry- dress code is pretty much skinny jeans and a hoodie. Though being 7 months pregnant when I preach, there will be nothing skinny about me or the things I choose to wear. Which brings me to one of my minor anxieties about the week- I remember how judgmental I was as a student. I once completely tuned out a female speaker because she was wearing leggings, an embroidered sweatshirt, and flats- this was the mid-90’s and these trends hadn’t made the raging comeback they have today (save for the embroidered sweatshirt- those never go out of style!). 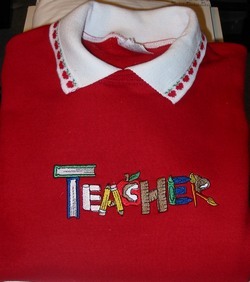 All I'd need to do is add the word 'Bible' above teacher & I'd have my uniform for the week! so hot. A female minister is told that she shouldn’t wear heels when she preaches because they are too seductive. Emails are sent to the head pastor when she wears pants, and when she wears a skirt because either way someone sees what she’s wearing as inappropriate. A male colleague argues with me after I offer to go shopping with another female colleague to help her decide what to wear when she presents at an international gathering of students. I am labeled ‘shallow’ and criticized for ‘conforming to this world.’ I am told that the content of what is preached is more important than what is worn & that content should be the only thing focused on. After reviewing a video of a talk with an older, male preacher who had a lot of influence in my life he comments on the poncho (another forgone trend!) that I was wearing during the speaking engagement- “was the poncho to hide your female form?” he asks. I am left wondering if my female form is something to hide or be ashamed of. crap! even burlap sacks to hide the female form are on the runway! what is a preacher to do! Generally my philosophy on what to wear when preaching has been along these lines. Beauty is a gift from God. I’m not talking about nose, hip or unibrow size here- there is aesthetic enjoyment in seeing something well tended. Whether this is a garden, a home or a face- God has given these things to us to take care of. I don’t think applying mascara is damaging what God has made me in the same way that I don’t think painting a house ruins the natural wood. Creativity is inspired by God. I enjoy fashion in the same way people enjoy other hobbies. Putting together an outfit, considering the colors, accessories and tone of what I want to wear is enjoyable to me. I love seeing how designers use their God-given talents to as artists create clothing or apply makeup in strikingly beautiful and creative ways. It’s an inspiring challenge to see what is in fashion & figure out how I can make it work for me. Haters may hate, but I’m going to be me. All I can ever offer is who I am- this is true when I stand up to deliver a message to college students about the amazing love God has for them, or whether I’m sitting and playing with my son. Ultimately one needs to come to terms with what Paul wrote in Galatians 1:10: “Am I now trying to win the approval of human beings, or of God? Or am I trying to please people? If I were still trying to please people, I would not be a servant of Christ.” Though I don’t think Paul was writing about whether I should wear heels or not when I preach, the point is that it’s about serving God with the gifts he’s given me rather than trying to please every person who has every stinkin’ opinion under the sun not only about what I’m wearing but what I actually have to say. 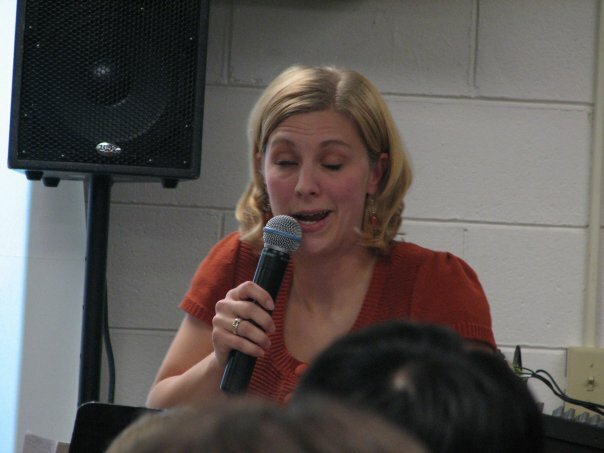 looking super awesome a few years ago while preaching at a student conference. Which in the end- what I say is what I pray my audience will remember, long after they’ve forgotten the ponchos and embroidered sweatshirts. And hopefully, through the power of the Holy Spirit they won’t even remember who the messenger was, or what she was wearing but that through the message they experienced the love of Jesus. How I’d love to hear you and see the great outfits you will wear. I’m glad you wrote this so I can better understand what you face as a preacher who is a woman made in God’s image. He rejoices over you. O Holy Spirit come and touch and change all at focus week such that none go home the same as they were when they came.